↑ Brodde O. E. et al. Terbutaline-induced desensitization of beta 2-adrenoceptor in vivo function in humans: attenuation by ketotifen //Journal of cardiovascular pharmacology. – 1992. – Т. 20. – №. 3. – С. 434-439. ↑ Pauwels R., Van der Straeten M. The effect of ketotifen on bronchial beta-adrenergic tachyphylaxis in normal human volunteers //Journal of allergy and clinical immunology. – 1988. – Т. 81. – №. 4. – С. 674-680. ↑ Burniston, J.G., et al. (2002). 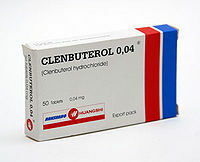 Myotoxic effects of clenbuterol in the rat heart and soleus muscle. J Appl Physiol. 93:1824-32. ↑ Blanco, A., et al. (2002). Testicular damage from anabolic treatments with the beta(2)-adrenergic agonist clenbuterol in pigs: a light and electron microscope study. The Veterinary Journal. 163:292-98. ↑ Blanco, A., et al. (2001). 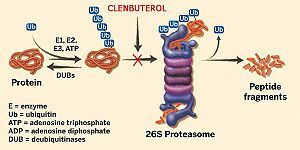 Morphological and quantitative study of the Leydig cells of pigs fed with anabolic doses of clenbuterol. Res in Veterin Science. 71:85-91. Эта страница последний раз была отредактирована 6 июля 2017 в 07:33.